DUC uses the effect of acceleration and decelaration of acoustic signals travelling in a moving liquid. Two ultrasonic clamp on transducers are mounted (from outside) on a pipe and produce an acoustic path. 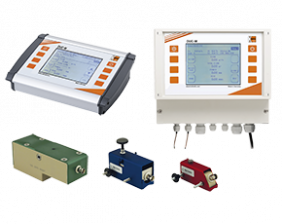 The transducers send and receive acoustic signals and the transit times t1 and t2 are measured by an electronic flow transmitter. The signal from transducer A towards transducer B is accelerated by the flow (short t1). The return signal from transducer B to transducer A is decelerated by the flow (longer t2). The difference between t1 and t2 together with the ath length L can be used to determine the average flow velocity. This principle is known as the acoustic time-of-flight principle. The flow is calculated from the geometry data of the pipe and the flow velocity. DUC emits coded signal pattern into the pipe. The received signals will be compared with the sent signals and only signal pattern which correlates with the original one will be used for flow calculation (cross correlation based signal evaluation). The calculation of the flow is done with the integrated DSP (digital signal processor). Thus the calculation has high sampling rates. The DSP calculation of the time-of-flight is a pure digital transit time measurement, it works very precise, is completely drift and maintenance free and there is no need for recurring calibrations.